Bankruptcy may help you in getting utility services restored if you were behind on your gas or electric bill. If the gas or electric company is threatening to turn off the services, and you file bankruptcy before they do, the federal stay under 11 U.S.C. 362 will prevent the utility company from shutting off the service. If the utility service has have been disconnected for nonpayment, bankruptcy can help in getting them turned back on. Pursuant to 11 U.S.C. § 366, if you owe back payments on utility services and you file for bankruptcy, the utility company cannot alter, refuse, or discontinue your service. This statute is similar to the automatic stay, but is another specific section of the bankruptcy code providing clear protection. This section also prevents the companies from refusing to provide service just because you filed for bankruptcy. the basis of the commencement of a case under this title or that a debt owed by the debtor to such utility for service rendered before the order for relief was not paid when due. You may be eligible to discharge or wipe out the old debt related to the gas or electric. After the bankruptcy, however, you do have to pay the gas and electric going forward or you will risk shut off again. A utility company cannot discriminate against a customer because they filed bankruptcy. Furthermore, utility companies may not refuse services related to old back due debt that may be wiped out in a bankruptcy. This being said, sometimes a debtor may have to put a deposit or pay a reconnecting fee to get service up and running. 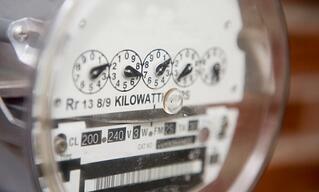 It is always better to file the bankruptcy before your gas or electric service is shut off. If you have questions related to a potential shut off of gas or electric service and are considering bankruptcy, please feel free to give one of our firm's New Jersey Bankruptcy Lawyers a call.